An allergy is the overreaction of the immune system to something that’s harmless. 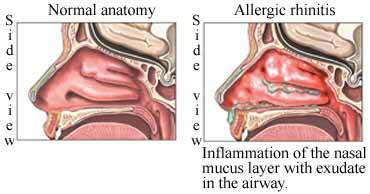 Allergic rhinitis is irritation and swelling in the nose. A chain of events starts when allergens are breathed in from the air. The most common are from grasses, trees, weeds, or animals. This is a very common problem for millions of people in the US. But, they don’t happen to all people. Seasonal—Happens mainly in the spring, summer, or early fall. Causes are from grasses, trees, weeds, or mold spores in the air. Perennial—Happens year-round. Causes are from dust mites, cockroaches, animal dander, or mold spores. For some, food allergies may cause this type. What are the risk factors for allergic rhinitis?What are the symptoms of allergic rhinitis?How is allergic rhinitis diagnosed?What are the treatments for allergic rhinitis?Are there screening tests for allergic rhinitis?How can I reduce my risk of allergic rhinitis?What questions should I ask my doctor?Where can I get more information about allergic rhinitis? Allergic rhinitis. American College of Allergy, Asthma & Immunology website. Available at: https://acaai.org/allergies/types/hay-fever-rhinitis. Accessed October 15, 2018. Allergic rhinitis. EBSCO DynaMed Plus website. Available at: http://www.dynamed.com/topics/dmp~AN~T116217/Allergic-rhinitis. Updated July 9, 2018. Accessed October 15, 2018. Allergic rhinitis. Merck Manual Professional Version website. Available at: https://www.merckmanuals.com/professional/immunology-allergic-disorders/allergic,-autoimmune,-and-other-hypersensitivity-disorders/allergic-rhinitis. Updated January 2018. Accessed October 15, 2018.